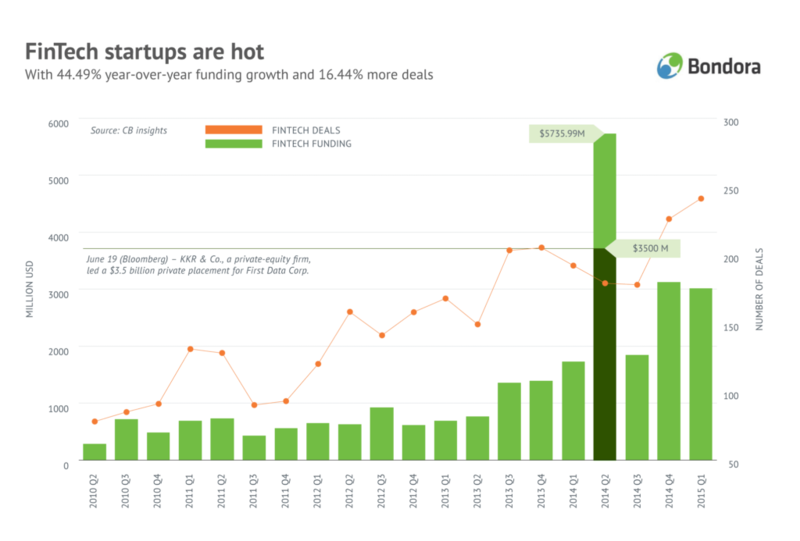 What opportunities are investors and Fintech startups going for? European FinTech trends: What opportunities are investors and startups going for? ‘Unicorn’, a favorite VC buzzword, has been steadily growing in search volume alongside ‘FinTech’ during the last few years. See Google Trends for comparison. This was the case even before Aileen Lee’s TechCrunch piece. The hunt for companies with >$1bn valuation has been on for a few years, and FinTech now has 36 of them thanks to 25 new additions to the herd. The hype machine is running at full speed. Companies are beefing up valuations for Google Ventures, MasterCard, American Express, Visa, JPMorgan Chase and Goldman Sachs. Venture capital is running wild, with 75% of the largest investments raised in the last 5 years in late-stage rounds. What lies beyond the magical land of unicorns, ominous headlines and bottomless corporate wallets? What does it mean for investors looking for alternative investments? The short and sweet answer is that US money is mostly driving Central and Northern European FinTech growth (surprise, surprise), which is still outclassed when compared to London, New York and Silicon Valley. There is hope and opportunity for European investors and startups in everything from payments to bitcoin. Here are a few facts, charts and links to back it up. In 2014, 358 European tech companies were bought for over €80.14B. Out of those, around a third were sold to US companies. One-tenth went to UK firms, and a little more than that to German ones. The rest went to France, Spain, Russia, Sweden, Canada, Switzerland, The Netherlands and Denmark. However, these numbers still represent a mere fraction of the deal flow of US firms. FinTech alone had $13.7B in funding last year. These were dominated by Silicon Valley deals (there were over 3K deals done during the past five years – click the chart for more details). Europe’s FinTech investment, by comparison, has increased by 215% to $1.48B in 2014. The interesting insight comes from looking at the chart below. 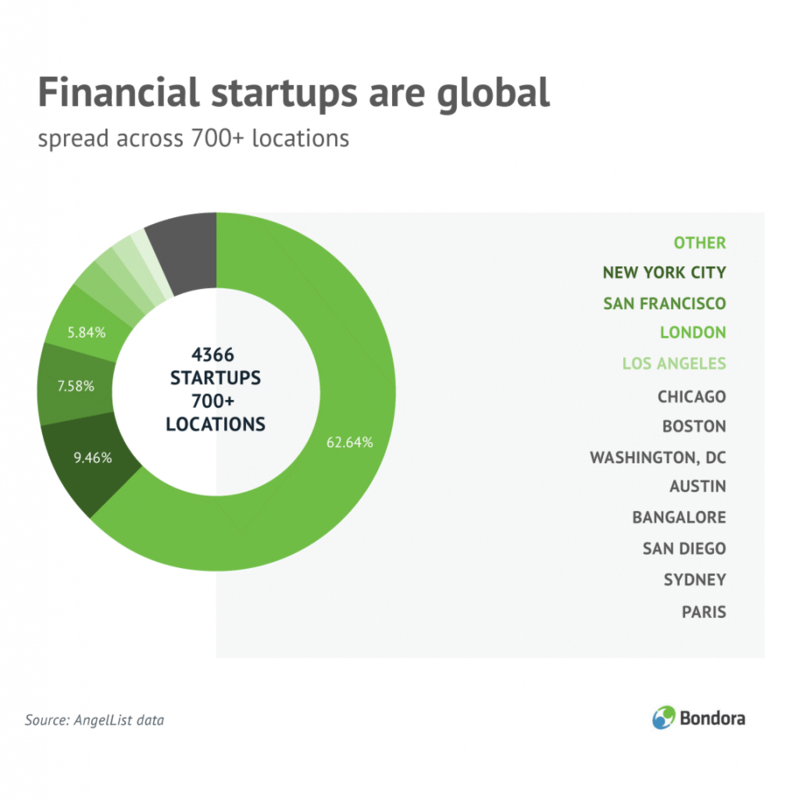 We can see that during the past 5 years, out of 4K+ Financial Services companies registered on AngelList, over 60% are located in cities all across the globe, beyond New York, San Francisco and London. So while the money is in the US, the startups are everywhere — including the diverse Central European and growing Nordic and Spanish scenes. We get it. The Americans, British, Germans, French, Spaniards, Nords all want a larger piece of the Financial Services pie. The main bets lie in payments, mobile point-of-sale systems, lending, crowdfunding, personal banking and bitcoin. We know because we have crunched through the market data of thousands of startups and will be dissecting most of the categories in our next post. For the P2P lending category, and Bondora investors, this means continued growth — both in valuations and demand from private and institutional investors. P2P Lending, one of the oldest FinTech categories, received a bit over $1B from 2010 Q2 – 2015 Q1, while Crowdfunding platforms have raised $375M in the same period. 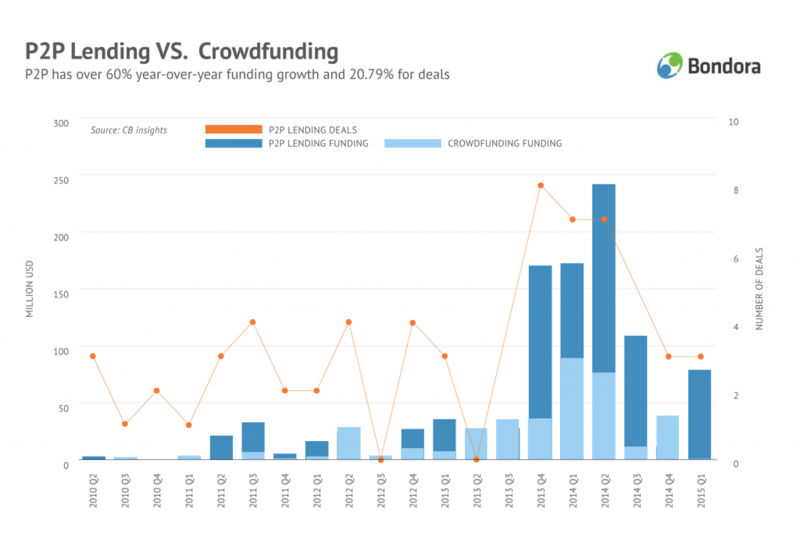 Bondora is part of this larger trend and is one of the fastest growing P2P lenders in the world, according to Crowdfundinsider. The early Lending Club backers demonstrated this by investing $5M in Bondora in March 2015, and they are not alone in betting on the category. The following table shows the number of all AngelList investors in each respective FinTech country and market group, as well as a few trending startup newcomers. The takeaway from all of this is that there are a plethora of opportunities for FinTech companies to raise late-stage funding with US corporates, VCs and angels. The number of exits and unique investors is growing steadily year-over-year. The money poured into Silicon Valley, California, New York and London FinTech companies is creating a massive demand for talent and even office space. London, together with Ireland, still represents roughly 40% to 50% of European FinTech deals. This is creating an incentive for early-stage FinTech startups elsewhere in Europe to join a UK accelerator, raise B and/or C rounds, gain further traction and eventually be sold off to a US firm at constantly growing evaluations. Luckily, a rapidly growing number of startups in Central and Northern Europe are taking Bondora’s lead and keeping their HQs and talent at home (free from the poaching and distractions of Silicon Valley). This is giving more investors all across Europe an opportunity to band together to invest into everything from payments tech to P2P lending platforms.